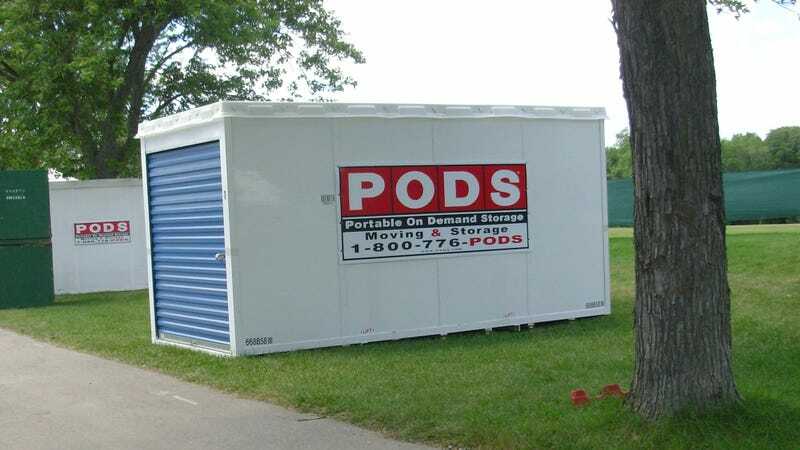 Prince Harry and Meghan Markle are about to enjoy their holy union in the intimate privacy of the PODS container they’ll be renting for over half a year. In a swoon-worthy moment of chivalry, Prince Harry used all his strength to hold open the pod’s vertically sliding door 2 feet high, just enough room for Meghan Markle to crawl under and into the storage box that will serve as her honeymoon locale until early 2019. Though the inside of the PODS container was completely dark and without any sort of lighting whatsoever, paparazzi photos managed to capture images of rose petals scattered across an assortment of lawn equipment and old, plastic-covered furniture inside the container—ooh la la! As if it weren’t obvious enough, this pretty much confirms that Meghan Markle is living out the dreams of every little girl in the world who wants their very own prince to take them in their arms and carry them into a 12-by-8-foot storage unit. Here’s to Prince Harry and Princess Meghan and their new lives together! This concludes ClickHole’s royal wedding coverage. We hope these festive and magical nuptials have reminded you that true love can only be attained by the wealthy and famous. So long!